Product prices and availability are accurate as of 2019-04-20 02:05:50 UTC and are subject to change. Any price and availability information displayed on http://www.amazon.com/ at the time of purchase will apply to the purchase of this product. Load up to 100 grams of coffee in the hopper. The top locks on with a quarter twist to prevent beans from flying out while grinding. If there isn't a scale available, each measurement mark on the side of the hopper represents ~10 grams of beans. The side mounted handle allows for a more natural motion and the ability to place your opposite hand on top of the grinder for stabilization. The handle is made from solid aluminum and complimented by a beautiful pakka wood knob. 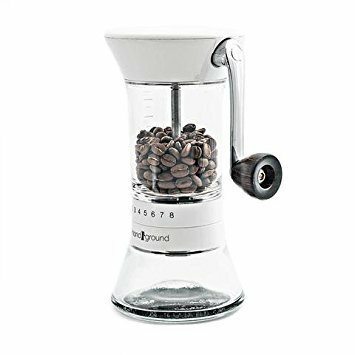 At the heart of Handground is a 40mm conical ceramic burr mill that crushes coffee beans into an even particle size. The geometry of the burr is fine tuned to balance the speed which it grinds and the torque required to turn the handle. The result is that grinding takes just the right amount of effort in the right amount of time. Running down the center of Handground is a stainless steel axle that drives the burr mill. The axle is mounted on metal bushings in three locations to keep it stable while grinding and eliminate burr wobble. It takes just seconds to disassemble Handground for cleaning. Simply turn the inner burr with the palm of your hand and the burr mill slides out.